I love this little motif! It's Design 3 from Tatting: 60 Original Lace Treasures by Christel Weidmann. This one is also done in size 20 Opera, color #506 (a very pale yellow... I thought I should clarify in case someone's looking for a beautiful creamy color). This design was very easy to tat, and it was a quickie. It measures about 2 1/4" across. I'm not sure how far I'll get in this book, but I sure am having fun! I just finished Design 2 from Tatting: 60 Original Lace Treasures by Christel Weidmann. When I looked at the scan, I realized that I pulled too tightly when hiding my ends for the first round. If you look at the ring at the bottom, you can see that there is no 1/4" space between the small and large rings. This is something I'll remember to watch for in the future! I love working with HDT, but I have quite a stash of thread that needs to be used. So, I've decided to use the threads I have on hand as my "practice" pieces. Then, if there's a pattern I really like, I'll make it in HDT. This idea of mine might change... I get really bored making more than one of something. Design 2 is tatted in Opera size 20, color # 506. The thread is very soft... kind of a strange feeling after the firmness of the HDT! I don't know if it's hard to retro-tat, because, believe it or not, I didn't have to undo any rings or chains in this one! One thing I'll do differently if I tat this motif again will be to increase the number of rings. Design 1 calls for 17 rings, while Design 2 requires 15. I had to do a lot of steaming to get this to lie flat. I had no trouble at all with Design 1. The two motifs are about the same diameter. The center opening is smaller on Design 2. I'm getting used to using my picot gauges... they really help when I'm measuring the space between the large and small rings! Luckily, I had enough thread to make another of Christel Weidmann's Design 1. All the picots are in the correct place, and all the joins are correct, so I am very pleased! If you look at the pin head, you can see where I made the mistake on the first motif. I guess I don't have to worry about that blind man on the galloping horse after all! I haven't had much time to tat or do any other type of needlework since school started a week ago, but I try to set aside a little time each day. I've started "Eleonora" by Iris Niebach, but I haven't had enough brain power to concentrate on it. I think I need to borrow one of Jane's brain cells! Anyway, I decided something nice and easy was in order, so I decided to tat Design 1 from Tatting: 60 Original Lace Treasures by Christel Weidmann. I love the way it turned out! It's a shuttle only pattern, and I used one Clover shuttle full of size 20 Berry Parfait hdt from LadyShuttleMaker. It's about 3" across with a 1" opening. I think it would make a lovely little picture frame with my granddaughter's smiling face peeking through the lace. I guess that means I'll have to make three... one each for Eva, Lily, and the new baby due any time now! I finished "Cornelia" from Tatted Doilies by Iris Niebach last night. I stayed up past my bedtime to block it, and I'm really pleased with the way it turned out. I found two twisted rings, and when I took it outside to photograph it I realized that I didn't block very carefully. I was so eager to blog about it, I didn't take the time to block it properly, but as my mom would say... a blind man on a galloping horse will never know the difference! I'm sure my tatting friends will forgive my slightly messy display! It's so much fun to finish something and then show it off! The doily measures about 11" across. It's tatted in size 20 hand-dyed thread from Sherry Pence aka LadyShuttleMaker. The rings are in Citrus Limon and the chains are in Guacamole. I have to send extra special thanks to Sherry for dyeing another batch of Citrus Limon for me. I needed enough for just under 2 pattern repeats. So, if you're thinking of using HDT for this one, you'll need to make sure you have three 50 yard skeins, one for the chains and two for the rings. I've already started my next Iris Niebach doily... "Eleonora" in size 20 Apple Blossom from Pamela Myers. 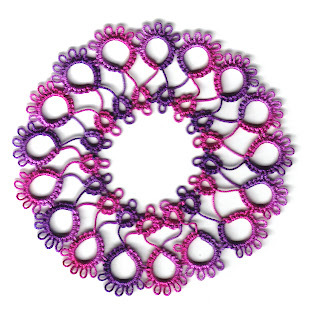 I'm really enjoying the challenge of Iris's designs, and I'm learning a lot about tatting! School's off to a great start! I can tell I'm getting older... I really need a beginning of the year checklist... I'm finding something each day that I forgot to set up! Luckily, I'm pretty good at adjusting my lesson plans on the fly... it must be that I've been doing this for so long. I can't believe that this is my 24th year of teaching, 23 of which have been in the library/computer program! I finished my second "Beatrice" from Tatted Doilies by Iris Niebach today. I tatted it in "Pensacola Beach" size 20 from Sherry Pence aka LadyShuttleMaker. My only problem with tatting Iris's patterns is that I would sometimes lose my place and pick up the pattern in the wrong place, resulting in the need to retro-tat. I tried something a little different with this one. I made eight copies of the pattern, one for each spoke of the doily, and colored in each ring and chain as I finished it. Coloring in the rings and chains helped alleviate that problem and left me with pretty straightforward tatting. I found out that Pamela and Laura do something similar! I plan on making one of Iris's doilies for each tray of my shuttle display case that my dad made for me. I think the doily helps set off the shuttles beautifully! This is my Grizzly Mountain Arts collection. This was a wonderful week... I got to spend time with two of my grandchildren twice in one week! Tuesday, Alison picked me up at the airport. Then Alison, Eva, and Aidan came to visit on Saturday while Dan was at a men's retreat. Eva and Aidan helped Aunt Carol and Grandpa "peel" the corn for dinner. We feasted on corn on the cob, tomatoes, watermelon, and musk melon both times! Ahh, summer! Mom and I both admired Laura's earrings when we met on Friday. I don't wear earrings because of allergies, but I found out the Laura can't wear gold earrings either, so I may try a pair of silver ones and see how I do. Any way, since I finished all of the crosses for Mom, I wanted to do something special just for her. We went to Michael's yesterday and found lever back earrings and beads to go with the lavender weaving thread that Mom used for a liturgical stole. 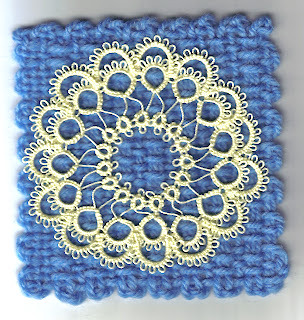 Nancy Tracy's Loopy Earring pattern is so easy to follow! Laura was right... it takes more time to string the beads than to tat the earrings! Mom is thrilled with the earrings, and they go great with the outfit she's wearing today... a blue pants suit with floral embroidery that has the same shade of lavender as the earrings! Mom says the earrings look like angels to her, and I think she's right! I might just have to follow Tattycat's lead and tat up an earring wardrobe for Mom! Hmmm... after looking at the super-sized picture of the earrings, I realize that I probably should have spent a little time laying them out neatly to do justice to Nancy's pattern. My apologies to Nancy. I tried taking pictures of Mom wearing them, but they're so delicate they don't show up well against Mom's skin. The earrings really are beautiful! My vacation with Mom is coming to an end way too quickly! I did manage to finish tatting the six crosses that Mom asked for to embellish liturgical stoles that she's making. In case you have read my posts about these crosses before, the smaller ones are in "Karen's Halo", size 20 silk from Sherry Pence aka LadyShuttleMaker. The larger crosses are in "Fortune", size 20 from Marilee Rockley aka Yarnplayer. Using this pattern, I think Marilee could have also named it "Old Rugged Cross"! Since the larger crosses are for Julian, I chose to leave the picots off the rings. I thought it made the crosses look more masculine. 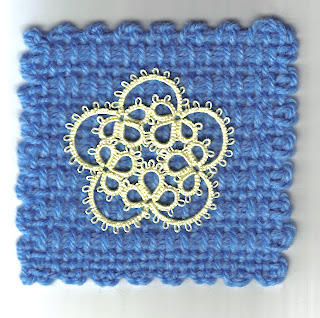 The pattern is "Traditional Cross" from Tatting Patterns by Lyn Morton. The camera does not do justice to either one of these threads... they are both absolutely gorgeous! I'll probably spend the rest of the day filling my floss bobbins with samples of weaving thread from Mom's stash... that is the ones she's willing to part with! I have had such a wonderful time in southern Alabama. I've gotten to know so many of Mom's friends, which makes me feel more at ease about her living so far away from my sisters, my brother, and me. If you have a strong network of friends, I think you can live just about anywhere, and Mom certainly has that going for her. And what fun it was to get to meet Laura aka Tattycat in person! We'd talked on the phone over the past year, so we already had a strong connection, but there's something special about meeting face-to-face! Bill teased us about what we had to drink for lunch (we had the giggles! ), but we honestly had nothing stronger than iced tea! We talked about other liquid refreshment, but didn't really have time to do anything other than talk... and tat! If any of you are ever going to be in the Chicago area, I would love to meet you! But you'd better hurry... I'm strongly considering moving my whole family to Alabama! Lunch and tatting with Tattycat! Mom and I met Tattycat (Laura) for lunch at Jesse's in Magnolia Springs today... we had a wonderful time! Laura tatted beautiful button hearts for Mom and me out of some of Sherry's beautiful thread! I did it! Not only did Laura teach me the split ring, she also taught me how to join split rings, and how to make a one-shuttle split ring! Now all I have to do is practice, practice, practice! Unfortunately, our time together did have to come to an end. Bill kindly agreed to be our designated photographer and took several pictures with Laura's camera and mine! I wish all of you who have become our friends in Tatland could have been with us. We had a wonderful time! No pics today... Mom and I went browsing in a beautiful antique shop looking for tatting shuttles and thimbles, but came up empty. That's o.k. I really do have enough tatting shuttles and thimbles! Next we stopped at our favorite oriental shop. I found a cute little bowl that will be great for holding my tatting threads. I really don't need another bowl, but how could I pass up a $2.00 bargain? We planned on going to Papa's Place for lunch, but they discontinued serving lunch last week... drat! We were forced to go to O'Charley's, where we indulged in red bean and rice soup (outstanding! ), chicken fingers, and caramel pie ice cream. I'd never been to O'Charley's before, but I hope to go again! There were only three of us at Purl & Chain yesterday afternoon. Bobbie is almost finished with her Auburn ripple afghan... one color repeat to go! Mom and I took yarn last week that nobody wanted (including us), and we're working on a six panel afghan. We should be close to finishing by the time I go home Tuesday. Mom had lots of fun playing with her Kindle. She found three sites with free books to download, including the Gutenburg Project, Melissa! Mom looked up titles from her favorite authors when she was young including Edgar Rice Burroughs and Gene Stratton-Porter. With the titles Mom found, we figure she'll make up the cost of her Kindle in no time! It was kind of fun sitting here trying to remember titles of books we'd read a long time ago! Today we'll go to Rock Creek and meet Betty for lunch. Mom wants to work on a couple of small projects, so maybe today will be the day. One thing nice about this two weeks together is that we can do what we want, when we want, and not feel guilty about our choices. Hey... maybe that's what retirement is like! ...or, what to do with your obsolete bookmarks! This past spring, I attended a workshop presented by Jim Trelease, author of the Read-Aloud Handbook. It was my second time to hear Jim speak, and unfortunately my last... Jim is retiring this year. As a school librarian, one of my favorite jobs is reading aloud to the kids. Some, of course, are bored, but most of them get so close to me that I can't move if I need to! I digress... Jim told us of a fabulous new device called the Kindle, available at Amazon.com. Have you heard of it? It uses G3 cell phone technology (like the new iPhone) to download books, magazines, newspapers, blogs, and probably more in less than a minute. It will hold up to 200 books, is about the size of a paperback, and about as thick as a pencil. Mom's apartment is lovely, but she doesn't have a lot of room for books, so she became very interested in the Kindle. Last week, while I was on the phone with my daughter, Mom looked up the Kindle on Amazon, and bought it! It arrived Monday, and I have to tell you folks, I'm putting it on my Christmas list! It's kind of pricey, but if I ask really nicely, maybe Dave and the girls will all kick in to buy one for me. So, here's Mom's Kindle taking a nap in her knitting bowl and recharging. Here's Kindle next to Mom's framed bookmark. I guess she won't have any more use for bookmarks! Luckily, not everyone is interested in owning a Kindle, so I will be able to give them as gifts! Yesterday, Mom's neighbor Dottie and her daughter Melanie asked us to be their guests at lunch. We went to Ed's Shed on the causeway by Mobile Bay. There was a beautiful breeze, and the humidity was low, so we ate on the porch facing the bay. We had a wonderful time! As a thank you, I tatted bookmarks for Dottie and Melanie. The one on the left is the insertion pattern I love so much. 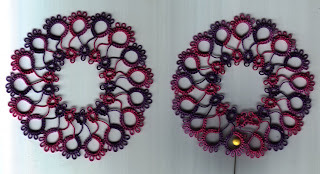 The one on the right is an adaptation of Lyn Morton's "Traditional Cross" from Tatting Patterns. The thread is Sherry Pence's "Berry Parfait", size 20. This morning Mom and I are going to visit our favorite oriental shop in Daphne. Then we'll go to Papa's Place for lunch. This afternoon we'll attend Purl & Chain and work on afghan panels. Mom is just about finished with her third panel. I'm about half way through my second panel... I've been doing a lot of tatting! We need six panels all together. The next step will be to crochet a border around each panel in a contrasting color. Then the six panels can be sewn together. I can't believe I'm getting in to the tail end of my visit... this time next week I'll be at school getting ready for the first week with munchkins! We have lunch dates for Thursday, Friday, Saturday, and Sunday... I've never had such a busy social calendar! Friday's the big day everyone... Tattycat, Mom, and I are meeting for lunch and an afternoon of tatting! I must remember to take my camera along! This is one of the best vacations I've ever had! Looking around Westminster Village, I've found several color combinations that I really like. If Sherry or Marilee ever choose to dye them, I'll be at their Etsy shops as fast as a I can point and click! What do you think of Summer Bouquet... purple, lavender, pink, and green? How about Crepe Myrtle... deep pink, dark green, and brown? I would love to work with Terra Cotta... reddish brown, bluish grey, and tan. I would call this one Faded Summer... washed out shades of green, lavender, brown, and white, with a splash of yellow. I know nothing about dyeing, and I'm not sure these color combinations are even possible, but I can dream! As you can see, I've been very busy with tatted crosses. You've already seen the three silk crosses out of Sherry's Karen's Halo, size 20. Marilee came up with a new gold combo called Fortune, which I think is fabulous. It's also size 20, but it's pretty obvious to me that size 20 silk is much finer than size 20 cotton. The faded looking little cross is actually tatted from some of Mom's weaving thread, 20/2 Astra, a perle cotton from Yarn Barn of Kansas. It's the lighter lavender thread in Mom's woven piece. I was surprised at how easy it was to tat with, and it's even finer than the silk. Of course, I have no idea how weaving thread size compares to tatting thread, but I thought it would be interesting for all of you to see the comparison. I suppose I should have blocked them first, but if you click on the picture, I think you can get a good idea of the difference in thread size. Mom and I are also working on a crocheted afghan for her Purl & Chain group. The afghan will be part of a silent auction to raise money for the Westminster Foundation. I can't believe I only have one week left to visit! Yea! I finished the three silk crosses for Monnie's liturgical stole! Monnie is the associate pastor at Mom's church. The crosses are from Tatting Patterns by Lyn Morton... a wonderful book! The thread is size 20 silk from Sherry Pence aka LadyShuttleMaker. The color is Karen's Halo. I think silk thread is a must-have item for my tatting thread stash! Mom's new loom arrived early Friday afternoon. Luckily, there are strong men at the Village who are willing to deliver large packages such as looms! Mom's new loom, a Baby Wolf, came fully assembled... sort of! First she had to take off all the plastic strips and strings holding the loom together for shipping, and then she had to unfold it... not a big deal! Of course, Mom had to feel the smoothness of the wood and get close for a good whiff of the wood! Smelling a new loom is a necessity, just like smelling a new book! Next, Mom had to add the heddles to the loom. This took a little bit of time... there are 400 heddles! Mom's new loom can be folded up and moved, but in order to do that she had to attach wheels. It took a little bit of time to figure out the directions, but she did it! Three hours later, Mom's brain had had enough! She gave up for the day, and finished with the final little bits on Saturday. Her loom is beautiful, and I can't wait to see what her first project will be! Today, after church, Mom and I drove over to Barrancas National Cemetery in Pensacola, Florida... about an hour away. None of us had been back to Barrancas since Dad's service, and we wanted to see his engraved stone. Mom was able to walk directly to the correct area, and found Dad's stone right away. Although Dad served during the Korean War, he never left the United States. He maintained airplanes at Langley Air Force Base, where I was born. I find military cemeteries to be very peaceful. There was a national cemetery close to our home in Philadelphia when I was a little girl. I loved the parades that were held on Memorial Day, and I think that witnessing the ceremonies held at that cemetery helped instill a deep feeling of patriotism in me. This gazebo (I'm not sure if that's the correct term) is where Dad's military service was held last December. After visiting the cemetery, we went to McGuire's Irish Pub for lunch. It was a favorite stop for Mom and Dad. We shared a corn beef sandwich and a potato appetizer called Irish Boxtys. They were made of garlic mashed potatoes rolled into balls and covered with some kind of crumb mixture that was deep fried... crunchy on the outside, soft on the inside. They were served with guacamole, sour cream with horseradish, and salsa for dipping... yummy! Of course we ate way too much food, so we're thinking simple salads for dinner tonight! Before dinner, I think a nap and some tatting are in order... nap first... zzzzz! Sorry, no pics today. Mom and I had a very busy day yesterday. We started our day with a half hour walk on the treadmill, then headed back to the apartment. Mom read the newspaper while I caught up on blogs and e-mail. We had scones for breakfast... yummy! Next we headed off the Fairhope to have coffee at Latte Da and to look for books in Page and Palette. Of course we found some! Our next stop was The Church Mouse... we needed more scone mix! I also found two little creamers that I just had to have. Mom bought me a beautiful little Dresden dresser tray... I know... I'm spoiled! We headed back to the village for our luau lunch... fabulous! Mom had mahi mahi, and I had chicken. I would have loved to try the mahi mahi, but I'm allergic to seafood and I'm very cautious about fish! The cook also had some pulled pork for us to try, a marvelous sweet potato dish, rice, asparagus and bok choy fritata, and an array of desserts. We took home salad fixings so that we could have a light dinner. We tatted and chatted in the afternoon. After dinner we watched Michael Collins and worked on panels for a crocheted afghan. Early to bed, early to rise! We've already been for our morning trek on the treadmill. Mom's out walking Sparkle Plenty, and I'm ready to cool off in the shower and then head down for coffee. We'll be busy again today... Mom's new loom is arriving this morning!